Big Brothers Big Sisters is launching a public awareness campaign to encourage volunteers to take an hour or two each week to act as a mentor to young men and women. The impact on a young person’s life can be significant and has broader social benefits. The visuals of the campaign are appealing and memorable. Here are some statistics from the Big Brothers Big Sisters web site. Did you know when a child is mentored through Big Brothers Big Sisters, the odds they will succeed economically and socially increase dramatically. They are 17% more likely to be employed, 63% more likely to earn a post secondary education and 80% more likely to live a healthy lifestyle. In fact, for every dollar invested in mentoring, $18 – $23 is returned back to society. Local administrator Mandi Lamb wants to get the message out to the local community. 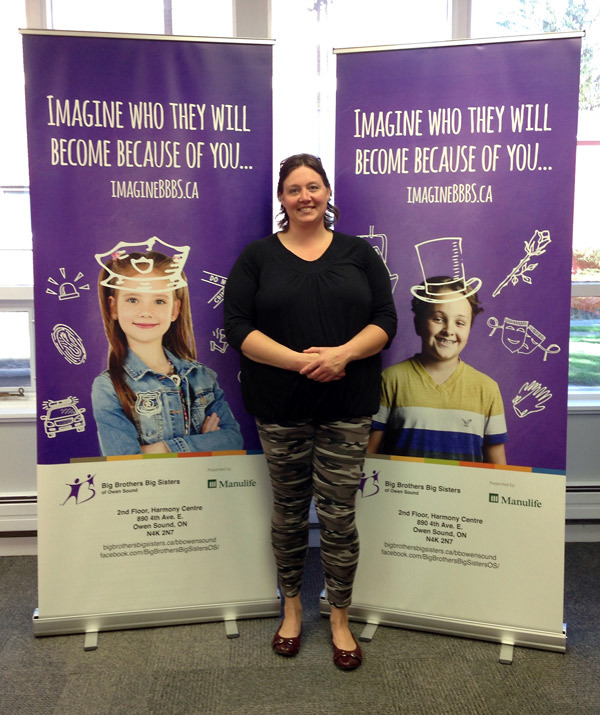 Big Brothers Big Sisters Owen Sound is growing. We are now offering our programs to both male and female populations, and are so excited to see the growth of relationships in our community. We are calling on the members of our community 18 years or older to spend an hour per week with a youth, and be a guiding voice in their life. Youth of this generation are the future and they have A LOT to offer; while each of us have experiences to share with them; it is a partnership that can change lives. CALL US TODAY! 519-376-4449. Qwik Print has helped Mandi get the message out – printing brochures and pull-up banners for use at events and public displays. The great graphics and strong brand message are ideal for this type of application. Clear and identifiable. Pull-up banners are available in sizes up to 33″ x 81″ offering high visibility for use in trade shows, meetings and public displays.